Perfect as an everyday accessory or ideal as part of a layered look, this sterling silver chain bracelet is a jewellery box essential and a great way to prepare for a gorgeous summer style. Featuring a glistening infinity symbol set with stunning cubic zirconia, this bracelet gives a subtle style and offers just the right amount of shine. 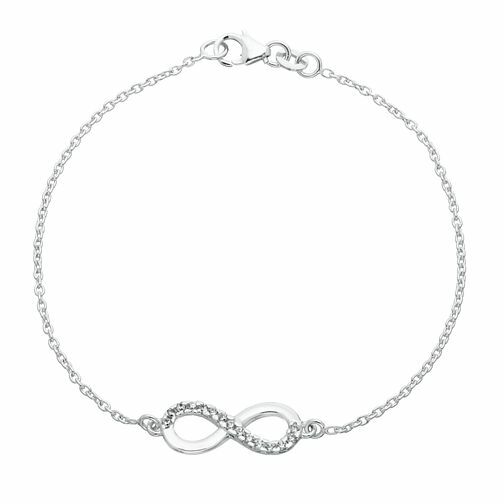 Sterling Silver Cubic Zirconia Infinity Bracelet is rated 3.0 out of 5 by 2. Rated 1 out of 5 by Anonymous from Bad Very bad looking bracelet. Looks like something you would buy in Penneys. Very disappointed, don't buy.